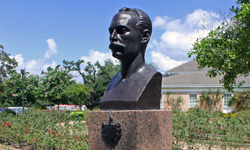 The monument to Jose Marti is a bronze bust on a granite pedestal. It is the work of Cuban native Tony Lopez, and it has been owned by the City of Houston since 1981. 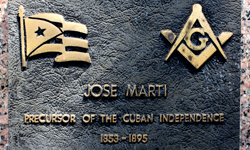 Jose Julian Marti Perez was a Cuban intellectual and writer who spent much of his life pushing the cause of independence for Cuba from Spain, as well as the need to prevent American expansionism into the island. He died in battle in 1895, and his death became a rallying point for Cuban independence. Lopez was born in 1918 in Cuba, and was interested in art from an early age. His father and grandfather were sculptors, and the younger Lopez learned about clay and carving in his father’s studio. The family fled Cuba with the onset of the Castro regime and Lopez lived the rest of his life in Miami. He died August 28, 2011. His work can be seen in galleries and collections across the country.